Answer: The International Space Station (ISS), like all other objects in orbit, experiences a slight amount of air drag, even at an altitude of hundreds of kilometers. The air gets pretty thin up there, but it’s still enough to cause friction and gradually reduce the speed of any orbiting object. Left unchecked, that loss of speed would eventually cause the ISS to fall back to Earth in a meteoric reentry and break up. That’s exactly what happened with Sky Lab back in July 1979. So every once in awhile they need to boost its orbit back to where it should be. They also sometimes change the orbit in other directions to avoid being hit by dangerous pieces of space junk. There are two ways to do this … either by using an onboard thruster in the Zvezda Module (see graphic), or the engines of a spacecraft docked with the ISS. 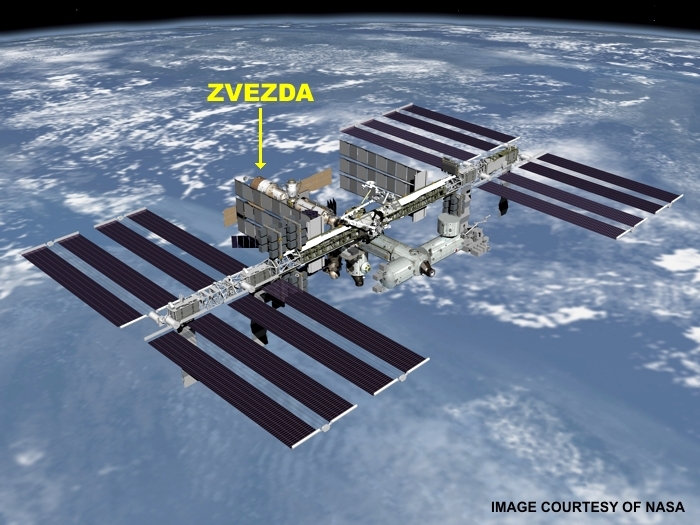 Note that the Zvezda Module is on the aft end of the ISS, opposite its direction of motion. Zvezda is always kept fueled for such purposes, and that fuel is re-supplied as needed by scheduled cargo shipments. Using a docked spacecraft is a “backup plan.” That can only be done if the spacecraft has fuel to spare, and they don’t usually carry much more than they need since unburned fuel is extra weight. By the way, your description of the ISS as “floating” is not quite accurate. It has a current total mass of over 400,000 kg, and is pulled downward by gravity with a force of 4 million newtons (about 1 million pounds). Gravity extends to that altitude (and beyond), and is only a few percent less than at ground level. So what keeps the ISS from falling back to Earth? Answer: The ISS is continuously falling toward the Earth. But its extreme horizontal speed of 27,724 kilometers per hour (17,227 mph) ensures that by the time it falls that distance the ISS has also moved over 8000 km (5000 miles) horizontally. And that’s just far enough to “miss” hitting the Earth and carry the ISS over the horizon. One might say the ISS is falling around the Earth, and gravity is what holds it in a circular orbit. So in the same 6 minutes it would take to free fall 640 km (400 miles), the ISS moves 8000 km (5000 miles) horizontally. Those two motions occur simultaneously, and the result is a smooth circular orbit. At higher altitudes gravity is weaker, and less horizontal speed is required to maintain orbit.